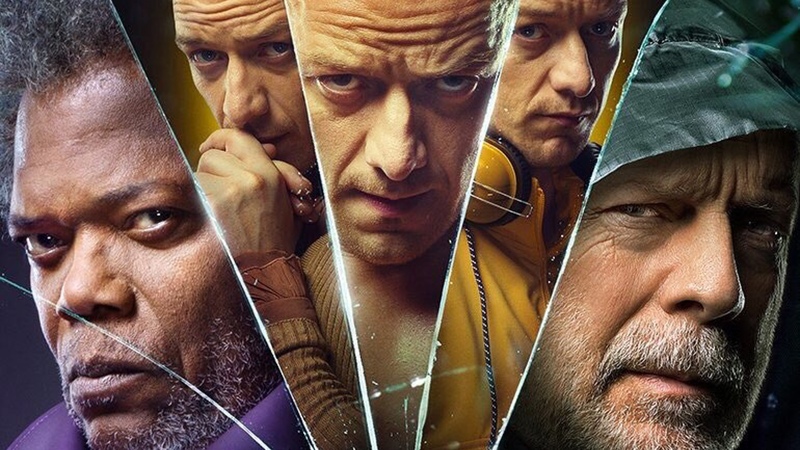 Glass is a psychological thriller and the final step to M. Night Shyamalan‘s trilogy of grounded superhero films, and it only took us 19 years to get here. It’s a sequel to both 2000’s Unbreakable and 2016’s Split as it unites characters from both previously isolated stories into a final showdown that may split audiences. Shyamalan had a lot ahead of him when it came to pulling off this film in which he had to merge the stories of two films, multiple characters, and close it all out in a way that satisfied long time fans. As a fan of Unbreakable I personally feel like he successfully crafts another gripping story here that had my mind darting and takes turns I never saw coming… a Shyamalan specialty. From the opening scene I was hooked and eager to see where the story would lead, and where it does go I didn’t necessarily expect. The story itself, how it’s centred around psychology, and the themes involved had my full attention and it pays off in spades in respect to both of the previous films. He does a great job at building and merging these worlds in a way that makes sense make it all feel connected. Now the directions taken won’t sit well with everyone, Shyamalan likes telling stories his way and he has his fun here with twists and turns which will please some fans but certainly not all. It may leave you wanting more but for me it is a natural and satisfying conclusion to this trilogy. Now where the plot itself I love, the pacing and the delivery of the story is where Glass does have some issues. It begins very rapidly, it throws you back into this world with a heightened sense of drama and action and it’s all great. Then it slows down drastically once the core plot of the film comes into play along with Sarah Paulson‘s character. It does build slowly but for the most part it runs at a very calculated pace and most certainly is not rushing towards the end any time soon. The slower pace isn’t the issue, it’s that it’s a little uneven in its tone and even though the pacing is slow it still jumps around here and there when focusing on different characters. If anything it just makes the film seem a bit longer than it is as it can seem like it’s drawing things out. One thing no-one can knock down when it comes to this film are the performances because the main players bring their A-game in damn near every scene. From Unbreakable, Bruce Willis and Samuel L Jackson jump right back into their characters and pull off an accurate representation of where they would be 19 years later. Every one of their scenes is captivating as their clashing views of the world make for some great dramatic tension. It’s like they never left behind the characters with how easily they delve back into the roles. Then you have the Split side of things where both James McAvoy and Anya Taylor-Joy return to their characters and to great effect. McAvoy may even be the standout of the film above Willis and Jackson as here he portrays even more of Kevin’s alternate personalities than he did in Split and it’s even more impressive now than before. The way he jumps back and forth between the personalities is mesmerising in itself and worth checking this out for. I didn’t know how Anya Taylor-Joy was going to fit into this film with everything going on but she’s a great addition who brings plenty of emotion to the story. Sarah Paulson’s character is the new addition here as the one psychoanalysing our heroes and villains and where she’s definitely not the most intriguing character in here she’s a great companion piece who drives the plot forward. There are other roles in here I’ll let you uncover through seeing the film as they’re nice surprises. From a technical standpoint, Glass has M. Night Shyamalan written all over it. The oblique camera angles and unconventional framing can be annoying to some but it all contributes to how Shyamalan tells his story. The colours and simplicity of the environments is all presented exquisitely through some great cinematography work which gives off the feel of both Unbreakable‘s and Split‘s atmosphere. The score is used to harken back to moments in Unbreakable which I loved as the Unbreakable score is one of the best. He really has put his all into this conclusion and it pays off in my eyes. So that’s that… the conclusion of Shyamalan’s Unbreakable trilogy has come and gone and it is incredible. Boasted by an intriguing and twisty story, riveting performances, and technical prowess Glass is a thoroughly enjoyable psychological thriller. It’s not without its flaws in that it suffers from some pacing and tonal issues throughout the second act but wraps everything up in what is an unexpected but deeply satisfying and exciting conclusion.